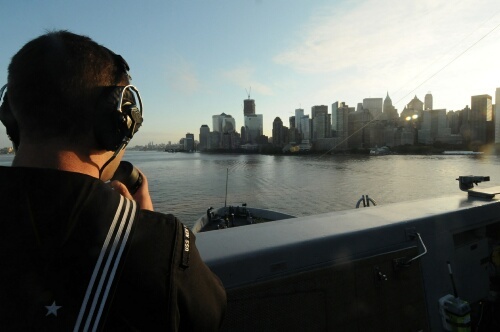 A Navy amphibious warship returned to its figurative and literal source Sunday, as the crew of the amphibious transport dock ship New York spent Sept. 11 in the Big Apple taking part in events throughout the city honoring victims and responders of the 9/11 terrorist attacks. The transport dock ship was named for the city that took the heaviest terrorist blow on that day in 2001, as nearly 3,000 people died when two hijacked jet airliners crashed into two World Trade Center skyscrapers — followed by a jetliner crash into a Pennsylvania field that took the lives of all 40 passengers and crew members, and another that struck the west side of the Pentagon, killing 184 aboard and inside the building. And its bow was fashioned from 7.5 tons of steel recovered from the shattered buildings, a rebirth being mirrored at the reborn site, where the twin-waterfall memorial built where the twin towers stood was unveiled Sunday. Embarked aboard USS New York for the transit from Norfolk, Va., to New York Harbor were 170 members of the 9/11 Families Association, including families of victims and first responders, 2nd Fleet said.